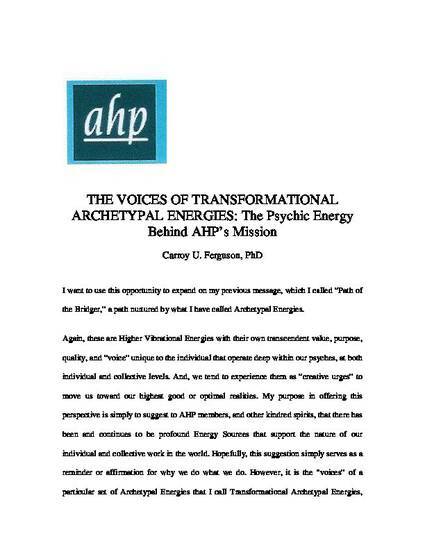 "The Voices of Transformational Archetypal Energies: The Psychic Energy Behind AHP's Mission" by carroy u ferguson, Dr. I want to use this opportunity to expand on my previous message, which I called “Path of the Bridger,” a path nurtured by what I have called Archetypal Energies. Again, these are Higher Vibrational Energies with their own transcendent value, purpose, quality, and “voice” unique to the individual that operate deep within our psyches, at both individual and collective levels. And, we tend to experience them as “creative urges” to move us toward our highest good or optimal realities. My purpose in offering this perspective is simply to suggest to AHP members, and other kindred spirits, that there has been and continues to be profound Energy Sources that support the nature of our individual and collective work in the world. Hopefully, this suggestion simply serves as a reminder or affirmation for why we do what we do. However, it is the “voices” of a particular set of Archetypal Energies that I call Transformational Archetypal Energies, which I think serve as the primary “Psychic Energy” behind AHP’s mission and “kindred spirits on the edge.” While I have mentioned them in other writings for AHP, I have not yet said that much about the nature of these “voices” (or feeling–action tones) and their Psychic Energy.